The Cave Girl Wig comes in Auburn, and includes bone as pictured. 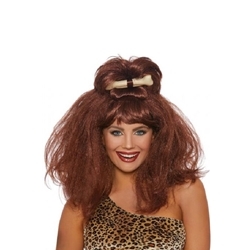 The Cave Girl wig is the perfect finishing touch for a Cave Woman costume for Halloween. Whether you’re braving the wilderness alone or venturing with a Cave Man, this wig will help you immerse yourself in your prehistoric costume!